Regardless of your feelings towards the San Jose Sharks, whether you’re a die hard fan, fan of a rival squad, or one of those fans who thinks they are the Western Conference Washington Capitals, taking in a game at the Shark Tank is a must. For years now, visiting NHL players have referenced the newly renamed SAP Center as one of the most difficult arenas to play in as an opponent. While the Sharks have fallen a few hundred fans short of sellouts this season for the first time in a number of years, the atmosphere is still largely the same. As intelligent fans understand, the Shark Tank, similar to CenturyLink Field where the NFL’s Seattle Seahawks play, isn’t especially loud because of crazier fans. The reality is that both venues happened to be designed and built in a way that better funnels the noise down to the playing surface. Of course there is also the rumor that the Seahawks pump in crowd noise over the sound system. The Sharks however, have no rumors in that regard. The SAP Center, infamously built without a press box, has an upper bowl built much more vertical than other arenas. The fans are right on top of the action, creating that loud atmosphere, particularly for playoff games. Don’t miss out on a trip to the Silicon Valley if you’re a hockey fan. With the new NHL schedule back to the old days where every team plays every other team twice a season (once in each city), there is an opportunity for fans of all 29 other NHL teams to see their club in San Jose. For NHL fans that just want to take in a game regardless of the Sharks’ opponent, there are a handful of clubs that make for great atmospheres. Even with the Detroit Red Wings now in the Eastern Conference, there remains a strong rivalry between Detroit and the Sharks. San Jose head coach Todd McLellan was an assistant with Mike Babcock and the Red Wings before taking the Sharks job and the two teams have been frequent playoff foes over the years. 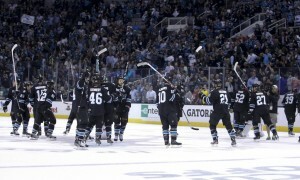 While the Kings and Sharks are bitter rivals playing in the postseason the past two seasons, Sharks and Ducks games are actually the more entertaining games. 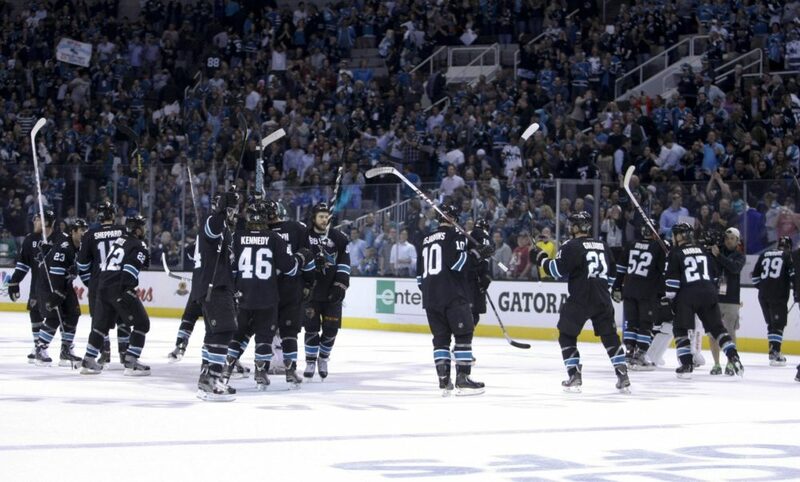 Earlier this year in Anaheim the two squads participated in a gong show of fights and in San Jose the Sharks skated off to a 6-4 win. The Chicago Blackhawks in San Jose are also fun games to watch. Like Detroit, Chicago fans travel well, and it is always entertaining in the building with a large amount of visiting fans starting cheers for their team with the locals trying to drown them out. 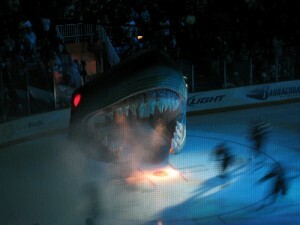 As for other attractions to attending a game in San Jose, well, they have arguably the coolest entrance in sports, skating out of a giant Shark head/mouth to the tune of Metallica’s Seek and Destroy. They also boast a world renowned mascot in S.J. Sharkie who frequently zips down to the ice from the roof like he is in a Mission Impossible movie. A fan favorite, Sharkie really knows how to jazz up the crowd. Some mascots are just silly excuses to have someone dressed in a weird outfit, but Sharkie is right up there with the Phillie Phanatic, as one of the best in the world. The Shark Tank experience is simply one of the best in the NHL and attending a game there ought to be on every fans bucket list. If you have kids, Sharkie is a hit for the little ones, and if you are there for the hockey and beer, the Sharks are still one of the most entertaining squads in the league.